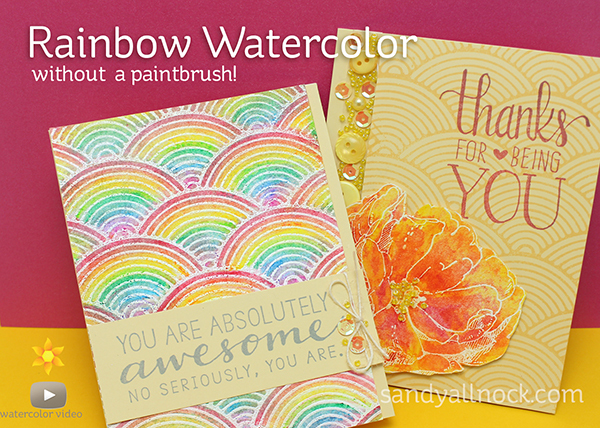 Rainbow Watercoloring – with no brush! Note: Remember how you guys crashed the Hero Arts store a couple times recently? Well, just in case that happens – please be patient. If you see something funky, don’t hammer the site by continually clicking; just go back later to enjoy a little shopping. The hop is still here for you to view! Plus – I’ll be over on Periscope with some Copic coloring, if you need a little fun! Welcome to my stop on the Hero Arts bloghop! I’m so grateful for the invitation to celebrate the 2016 catalog – and thankful for a few fun stamps to play with and share a technique with you. Be sure to scroll to the end to find out how to qualify for the giveaway – and to hop along to all the other blogs, too! 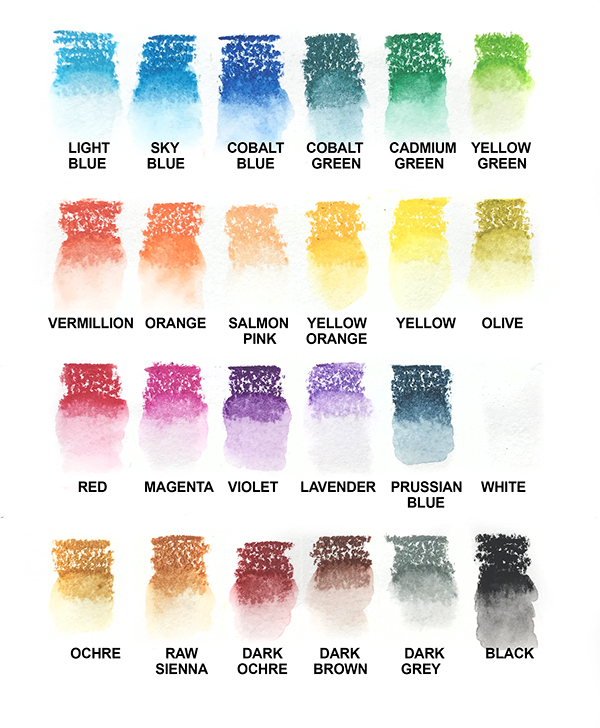 Right about the time I was pondering what to create for this bloghop, I was asked by a friend to send her the list of colors in my box of Prima Oil Pastels. Totally unrelated request – but I decided to swatch them for her too. And that – well, that led to thinking, man, I haven’t played with these in a bit, what if…..? And that’s where it started! I knew that these oil pastels have unique properties (and before I get asked – different properties than distress crayons, so hang tight, more will be coming on them soon!) – and wanted to see how I could play around with them in a new way. I was so excited to test it out with baby wipes – goodness gracious, how beautifully it moved the color! Watch the video below to see how – or click HERE to watch in HD on YouTube. For the card assembly, I stamped the background onto a layering paper so I could pop it on the yellow card base; that means the panel will be raised as thick as the button layer, so it’ll go through the mail easier than if there were just big lumps on one side of the card. The flower looks stunning over those buttons, doesn’t it?? The buttons shown are a new release coming to a store near you – a new line by my friend May! 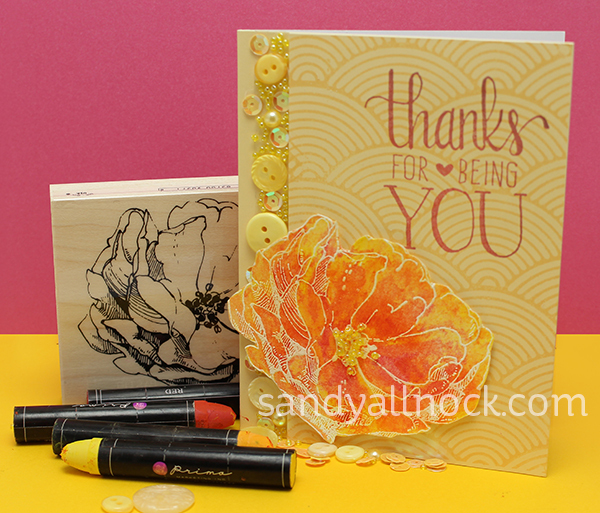 I’m so proud of her launch of a full line of embellishments in a variety of colors, and I’m honored she trusted me with a bottle of “Sunshine.” Since I was using the Hero Arts “Sunshine” layering papers and cards, it seemed appropriate to introduce them to each other! To add the embellishments, I used Be Creative tape – VERY sticky – and started with largest buttons first, then small, then sequins, then filled in with beads. Letting some hang “over” the tape made the strip look freeform even though it’s a straight strip of adhesive; and I also was thrilled not to have to adhere every bead down with glue. 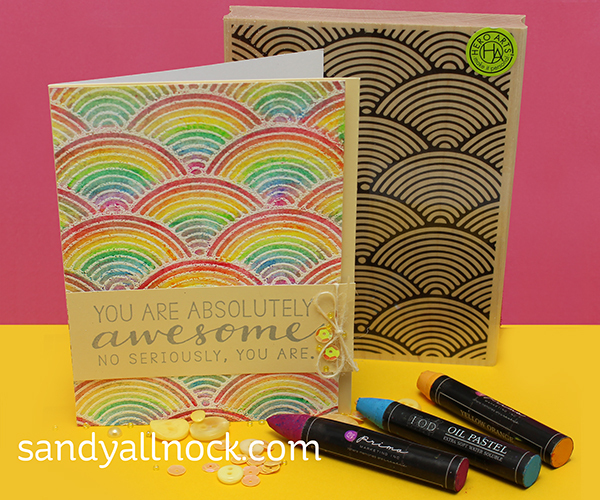 The second card is simply the rainbow panel, popped on dimensional adhesive, with a sentiment panel on top. This “Awesome” sentiment is one of my favorites Hero Arts has ever created, and I use it a lot for cards in my stash. I tied on a teeny bit of twine and added a few little embellishments to create a bit of sparkle. And done! Hero Arts is giving away four $25 shopping sprees, drawn from comments left across all blogs in the hop. Comment by 11:59pm PT on Sunday, February 14, and they’ll announce the winner on the Hero Arts blog the following week. Hop along and comment for more chances to win! Embellishments: Buttons from 28 Lilac Lane will be available soon at a retailer near you! Loved the cards!! Especially the rainbow one!! Fabulous cards! Love the Rose with the buttons and the pretty coloring for the rainbow card!TFS! I am so amazed that oil pastels would give that look. Beautiful cards! Love the tone on tone. I have never worked with the oil pastels; it’s amazing to see what can be done. Thank you AWESOME as usual, you are so creative thank you for all the work you put into your blog I love coming get to it! Love your awesome techniques. Thank you. Wow! Amazing cards and thanks for an awesome new technique. Also love the button border on the flower card. looks really, really gorgeous! Great cards – thanks for sharing the technique! You always wow us with new techniques and beautiful designs! Love this happy rainbow! These cards are bright, cheery, and most of all beautiful! They would brighten anyone’s day! I love the backgrounds you created with the wave stamp. Amazing cards. Love both your cards. FUN & FABULOUS cards Sandy!!! WOW – what an EXCITING technique – THANK YOU SO MUCH for sharing your CREATIVE INSPIRATION and video!! !